Social Media for Colleges follows the latest trends in social media use for colleges and universities. April Fool's. The most annoying day in the social media world. I suppose I'm nothing but a big old stick in the mud, but I tend to have very little patience for pranks, especially big budget ones like bacon-flavored Scope or the Google Nose. Yet even my cold, bitter April Fool's heart can admit when something is done well, and University of Oregon knocked it out of the park. That monstrosity you're looking at is one of the more notorious marketing flops here in the great Beaver State (of which I am a proud lifelong resident). 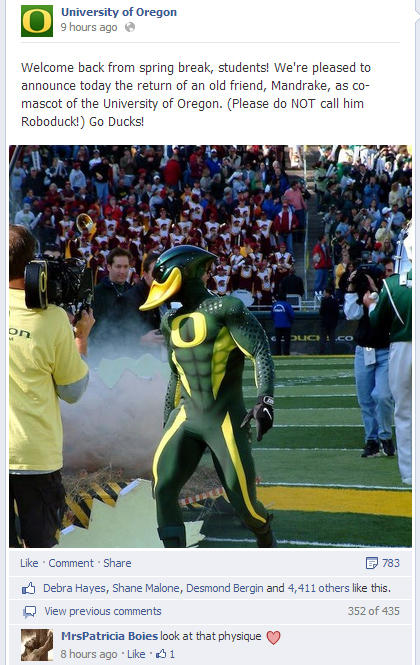 UO tried to bring their beloved Donald Duck-esque mascot Puddles into the 21st Century with this.... thing. It was horribly unpopular from the start, and once the name "RoboDuck" was coined, it was all over. I don't think it lasted even a year, and Puddles was quickly returned to the fold. What makes this particularly successful as an April Fool's gag was the willingness for UO to poke fun at itself. Self-effacing humor is tough to pull off, especially when you work in marketing. I mean, the whole point is trying to make yourself look as good as possible and spin negatives into positives, right? So props to Oregon for picking out something from the past that was widely panned and turning it into a fun joke. The engagement levels were huge, and while I'm sure most people had a good-natured laugh at UO's expense, I bet it also brought back some fun memories and feelings of nostalgia. In and odd way, you almost love the school more for it, you know what I mean? It's fun to remember silly, weird things from the past. In my opinion, this is so, so much better than some trite joke about how Frisbees are now banned on the quad or some such nonsense. Owner of Kuffner Creative - yes, you can hire me! - and for six years was Associate Director for News and Content Strategy at the University of Portland. Share a great #hesm idea and it might get featured! While I can't feature all the ideas that get shared with me, I will connect with you if/when I write about it for the blog.